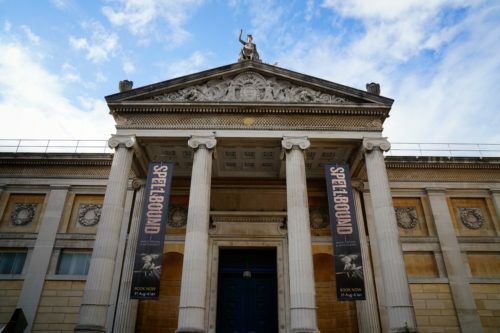 Image of the Ashmolean Museum, Oxford, featuring the “Spellbound” exhibition. Photo by permission of the author. Entering the ‘Spellbound’ exhibition, you are confronted with a ladder leaning against a wall like a menacing question mark. There is no avoiding this ladder. Do you walk under it or do you go round? Even before you are inside the Ashmolean’s exhibition space, ‘Spellbound’ asks big questions about magic, ritual, and witchcraft. The ladder is a clever prelude: it shows how magical thinking is not part of a past inhabited by our ‘superstitious’ predecessors, but smugly points out that we live in a magical world today (and will still do so tomorrow). The ladder sets the tone: visitors are encouraged to engage with their own magical thinking. By the time you have made your decision, you know not to approach the magical objects in the exhibition as unenlightened remnants of delusions and misconceptions. They are, instead, intrinsic parts of people’s ‘inner lives’—not incidentally, research from the Leverhulme Trust-funded project Inner Lives: Emotions, Identity and the Supernatural, 1300-1900 lies at the foundation of the exhibition. ‘Spellbound’ stretches out across three thematic exhibition spaces divided between learned magic, witchcraft, and folk magic, though they are best experienced in dialogue with each other: retracing one’s steps between rooms can help make sense of some of the more enigmatic objects, and help one draw emotional or sensory connections of one’s own. Together, the spaces immerse the visitor in more than eight centuries of magical thinking and feeling, simultaneously encouraging us to reflect on our own thoughts and feelings. The thematic set up invites us to draw connections across ages and cultures without, importantly, trying to convince us of a ‘universalist’ interpretation of magic. Its innovative approach—across themes and ages—raises questions of its own. How do you create an exhibition that aims to capture interiority and emotions, in particular when those emotions and their related practices are related to subjects as wilfully elusive as the magical and supernatural? The invisible is a tricky thing to display in a glass case of a museum. Thankfully for the curators (and for us), magic has been captured in a wide variety of writings and objects—sometimes literally—for example, the small flask which famously contains a witch came with a warning from the woman who donated it to the Pitt Rivers Museum in the early twentieth century: ‘…if you let him out there’ll be a peck o’ trouble.’ In fact, several objects in ‘Spellbound’ hail from the cabinets of Pitt Rivers and are re-imagined in what at first glance seems like a more sterile and modern museum environment. The supernatural and the magical, so this exhibition convincingly shows in the form of hundreds of things, were profoundly material categories. A second question that arises when looking at the many, very different objects is: How do you recreate a museum context in which a worn shoe or a feather can be ‘seen’ and ‘experienced’ by visitors as magical and emotional, ideally without having to read essay-length labels that explain its significance for the person who made it, kept it, or used it? Labels are used sparingly, and to effect. The meaning and emotional significance attributed to everyday objects instead becomes apparent when you take the time to look. Objects of magic show signs of emotional practices throughout the ages: pages of grimoires were read until they fell apart, things were carved, bound, charmed, pierced, tied, burnt, scratched, bottled. In other instances, the fact that they were kept is revealing in itself: the worn leather of a shoe found concealed under floorboards by homeowners, for example, attests to a patina of emotional and magical meaning that remains vivid despite—or because—of its mystifying character. The accompanying catalogue poignantly quotes Sara Ahmed’s The cultural politics of emotions on how emotions ‘stick’ to objects, whether we recognise them as magically material like the steel of a horse shoe and the obsidian of John Dee’s black mirror—or not. It is to the curators’ credit that visitors are compelled to figure out precisely how a shoe or corset were magical. 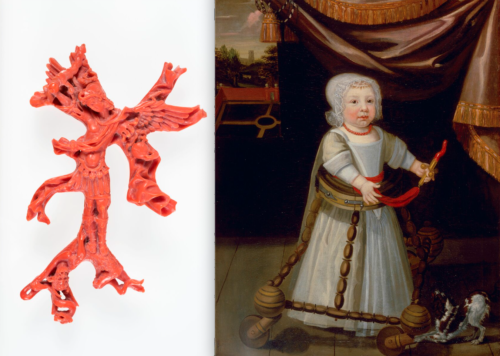 That materiality becomes particularly powerful when the exhibition lets different kinds of objects communicate with one another, as in the case of the Boy with Coral painting and the piece of red coral depicting St Michael defeating the devil. Several modern art installations beautifully enrich the visitor’s sense of wonder as they wander between objects. St Michael © Fitzwilliam Museum, Cambridge; Boy with Coral © Norfolk Museum Services. Both images courtesy of the author. ‘Spellbound’ makes clear how structures of magical thinking remain vibrant and flexible; they are not, nor were they ever paradigmatic, rigid belief systems. Rather, they constitute of pragmatic, idiosyncratic amalgams of beliefs, practices, and objects that made sense to individuals and shaped communities. They are profoundly human. This popular and charming exhibition will do much to rid us of the persistent dismissal of magical thinking as ‘superstition’ and to begin to take people’s experiences—past and present—seriously. Touch wood. Kristof Smeyers (Twitter: @kristof_smeyers) works as a doctoral researcher at the University of Antwerp. His research attempts to untangle the grey areas between science and religion in the nineteenth and twentieth centuries by focusing on supernatural religious phenomena in Britain and Ireland. Nicolás Monardes, Dos libros, El uno que trata de las cosas que traen de las Indias Occidentales, que sirven al uso de Medicina y como se ha de usar dela raiz del Mechoacan, purge excelentissma. (Sevilla, 1569). 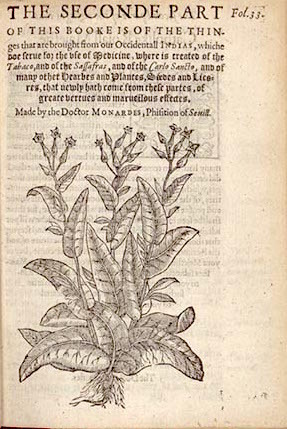 In 1565, the Spanish physician and herbologist, Nicolás Monardes wrote of the great secrets of nature revealed by Spanish encounters of the New World. In the first book of his Dos libros of medicine, Doctor Monardes remarked of the discovery of new and diverse kingdoms in the Occident that abundantly produced gold, silver, pearls, emeralds, and turquoise that were “a greatly admired by the millions all over the world.” The physician, who never ventured across the Atlantic, marveled at the bounty of the Indies as he wrote from the capital and imperial port of Sevilla. He noted that every year hundreds of ships arrived laden with animals and agricultural products—from across the region came “parrots, monkeys, griffons, lions, falcons, owls, tigers, wool, cotton and sugar.”  For the doctor, however, the wealth and abundance of the Indies lay not in minerals, animals, and cash crops, but rather in the botany and knowledge of medicine that grew in the Iberian worlds. Our Indies have given unto us many trees, plants, herbs, roots, juices, gums, fruits, seeds, liquors, and stones that have great medicinal virtues, that have been found to have great effect and precious value, all of which is said to be excellent and more necessary for corporal health than those things known through the world… And as our Spaniards have discovered new regions, new kingdoms, and new provinces, so too have they brought unto us new medicines and new remedies that cure many infirmities, which, without them, would be incurable and without any remedy. 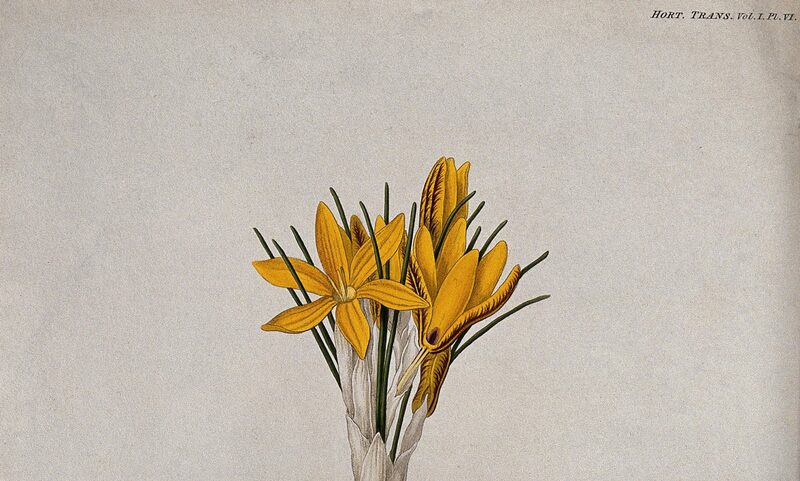 In the Dos libros, Monardes celebrated the remedial uses of saps and resins, bitumen and bezoars, and fruit and stones that came from the provinces of New Spain and Peru, such as the incense Copal from Mexico, the gum of the Caranna from Cartegena, and the Sulphur vivo (quick sulfur) of Peru. He advocated for the use of the Piedra de sangre (blood stone) as a remedy for the bloody flux the Pimienta de Indes (Indian Pepper) as a purgative. In the first published accounts to detail Çarçaparrilla (sarsaparilla), Monardes characterized the plant as critical medicine well known to both Natives and Spaniards from Nicaragua to Peru. Knowledge of the plant could provide remedies to grave pains and afflictions. El tobaco. 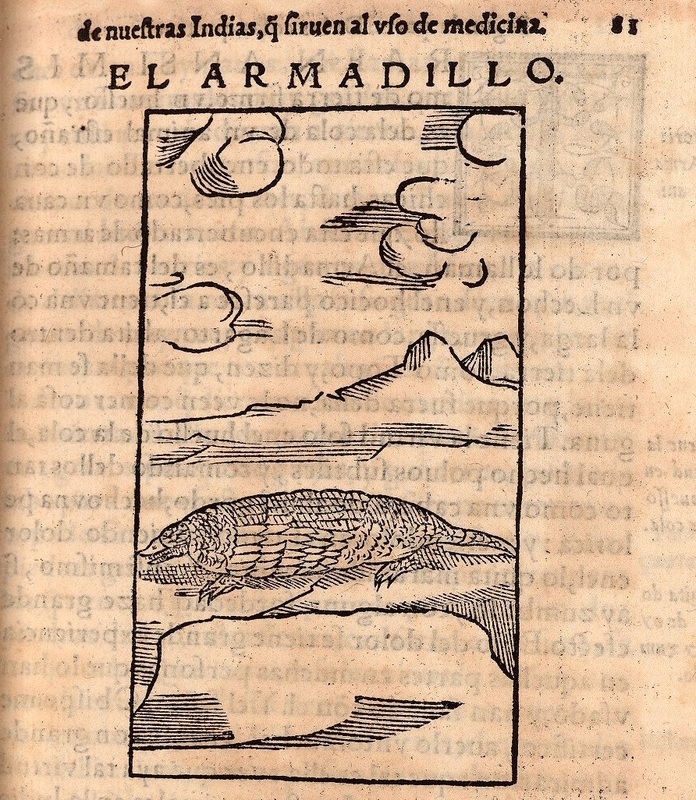 Nicolás Monardes, Joyfull Nevves of the newe founde world (London, 1577). Image courtesy of the Library of Congress, Washington, D.C., USA. 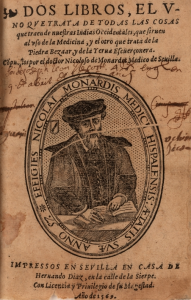 Although Monardes championed Spanish discoveries of subject populations and mineral wealth in the New World, he noted that medical knowledge was a product of experimentation and consultation with local sources of authority, including Natives and Africans. For instance, the knowledge of the healing roots of a plant known as Mechoacan, which were used to treat sores and pox among other afflictions, came from indigenous caciques and healers that encountered the first conquistadores in Central Mexico. Similarly, Spanish friars learned of purgative qualities of the milk of Pinipinichi plant from Nahuatl-speaking natives of the region. Africans experimented with sarsaparilla and Natives across the New World knew of the curative properties of tobacco. Monardes, a resident of Sevilla all of his life, drew upon the diverse sources of knowledge that flowed through Iberian intellectual and material world. Based on his work, it is clear that he drew upon the experience and perspectives of Spanish merchants and settlers as much as he took inspiration from Native informants and African healers. Joyfull Nevvs of the new founde world (London, 1577). 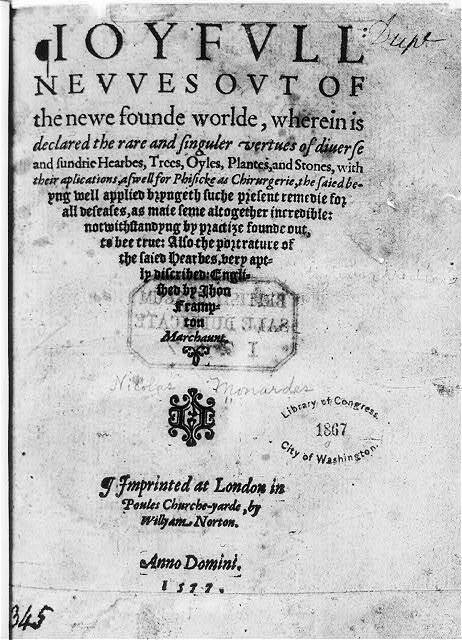 John Frampton’s 1577 translation of the compilation of the works of Nicolás Monardes. Image courtesy of the Library of Congress, Washington, D.C., USA. Within a decade of the publication of Nicolás Monardes’s Dos libros, the work was translated and published across Europe, with editions in Latin, French, Italian, German, and English. John Frampton’s English publication in 1570 bore the laudatory title Joyfull Newes of the New Found World, which emphasized the optimism and triumphant themes in the original work. El armadillo. 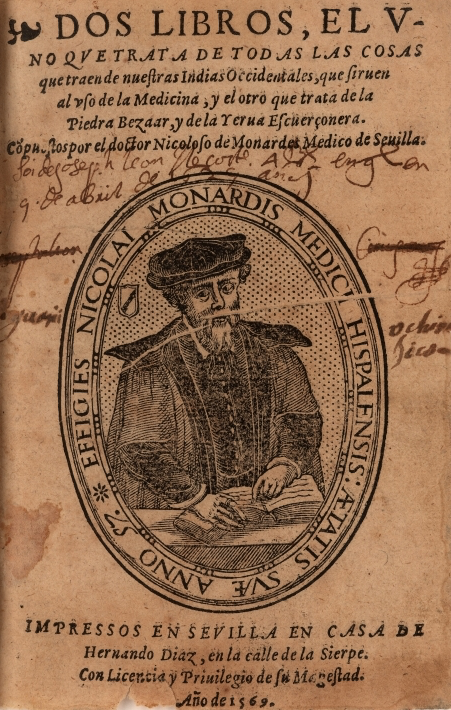 Nicolás Monardes, Primera y segunda y tercera partes de la historia medicinal (Sevilla, 1574). Image courtesy of the John Carter Brown Library, Providence, Rhode Island, USA. 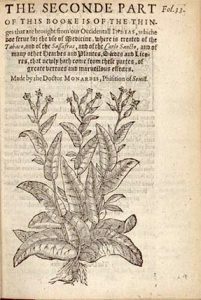 In subsequent works, the doctor went on to provide some of the earliest descriptions of the useful qualities of materia medica from the Iberian World, including tabaco (tobacco), dragon (dragon fruit), and armadillos. He championed the materia medica of the Iberian world of the sixteenth century. His work, however, was but one in an expansive intellectual world. This series of posts on medicine in Latin America and the Iberian World will look at those connections as a means to examine material, intellectual, and power relations. Monardes work demonstrated that the so-called Joyful New of medicine in the Iberian world was not simply a product of colonial discovery, but a result of complex interactions between Europeans, Natives and Africans across Iberian worlds. As the search for remedies took place across the Atlantic , medical knowledge systems created connections within and across imperial boundaries. The history of early modern Iberian and Latin American medicine shows that these connections were the products of local interactions that connected diffuse, diverse, and often disparate knowledge systems that took place on a global scale. In these posts we will explore remedies from across Iberian worlds, from Mexico to Peru to Brazil and the Caribbean. The recipes and posts that come in this series, we hope, will further shed light on the fascinating growing scholarship on the history of medicine in the early modern Iberian world, much as Monardes did himself more than four centuries ago. Joyful News! Nicolás Monardes, Dos libros, El uno que trata de las cosas que traen de las Indias Occidentales, que sirven al uso de Medicina y como se ha de usar dela raiz del Mechoacan, purge excelentissma. (Sevilla, 1569), 1v, 2r.